Not to be confused with Rudolf Höss. 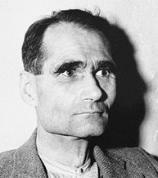 He died in the Allied Military Prison, Spandau, Berlin in 1987. Since 1966 he had been the only prisoner. His death was caused by a strangulation using an electrical cord; officials recorded it as a suicide. This page was last changed on 29 September 2017, at 08:43.